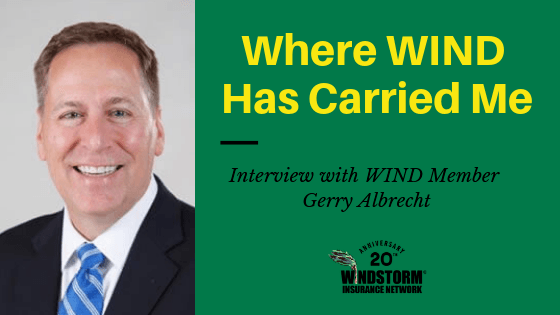 As part of our upcoming kickoff in 2019 of our 20th anniversary, we’re profiling our members and attendees on “Where WIND Has Carried Me.” When WIND was formed in 1999, the goal then (and now) is to offer education and industry insight to representatives from all facets of the property/windstorm insurance claims industry. Why did you become a WIND member? I joined WIND several years ago primarily to attend the annual seminar and to learn. It was also a great opportunity to market with clients. How has WIND helped you in your career? WIND focuses on both sides, and with AOBs, multiple sides, of any issue. So you learn the interests and arguments of all the parties. You also communicate not only with people of your “own side” but with the “other side” as well. You develop and build personal relationships which are invaluable to you whether you are litigating a case, marketing a client, or establishing relationships in order to get claims and cases resolved. Have you attended a WIND Conference? If yes, why did you attend? Yes-just about all of them (except when I was in trial). To learn, and to meet people. How has the WIND Conference helped in your career? Yes. I have spoken several times which has increased my visibility and my practice accordingly. I have developed solid relationships and I have learned a great deal. What do you wish other people knew about WIND? The quality of the programs and the collaboration of all parties. What would you tell someone who is thinking about joining WIND? It is worth the “bang for the buck” insofar as marketing, learning and networking with other property insurance professionals. As a property insurance claims professional, what are the trends you see for our industry? Of course, AOB issues, and professionalism/civility issues. Where has WIND carried you? We’d love to hear from you and feature you in an upcoming Where WIND Has Carried Me profile. Submit your story today!